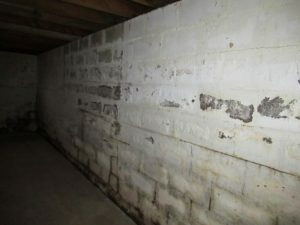 Concrete or “cinder” block foundation walls are fairly common here in Connecticut. The building industry refers to these blocks as concrete masonry units or CMUs. Modern foundation construction in this State will typically use poured concrete almost without exception. Some of the reasons for using poured concrete is strength, another is water resistance. 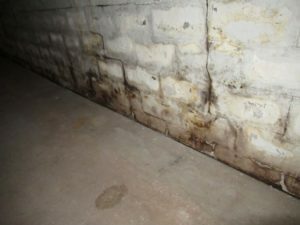 A fairly common issue with block foundation walls in my experience is water penetration due to the numerous seams in the wall. 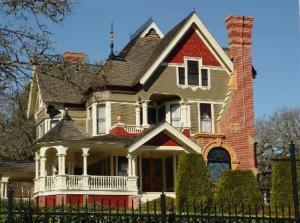 The other and more concerning, although a leaking foundation is a very close second, is structural failure. Either problem is usually costly to repair. On a recent inspection, I found both of these issues present while examining the basement. The front foundation wall displayed pervasive water staining and numerous cracks. The condition extended to the two side walls, diminishing where the soil dropped off due to the slope of the lot. The rear wall was completely above soil grade, a contrast of the front wall. Also telling was the presence of efflorescence on the blocks. The crystal like formation is an indication of the presence of moisture on the exterior side of the wall. The white deposits can be telling of an area where water dwells in the soil, indicating poor drainage and or a high water table. The basement had a perimeter drain and sump pump installed to manage the water that would come into the space, which by the evidence present was occurring on a routine basis. The issue that hadn’t been addressed was the failing of the front foundation wall. A horizontal crack was present slightly below midpoint along the wall. The crack extended just about the wall’s entire length. Vertical and step cracks were also present below the line of the crack. Horizontal cracks are concerning when present in block walls. The cracking can often be the point of failure in the wall. The crack is often the apex of a bulge. I discovered that to be the case here. When water is present behind the wall coupled with the soil it creates pressure. Saturated soil, expansive soils are capable of exerting an immense force that can overcome the strength of the wall. The problem here in my view would not be fully rectified by reinforcing the wall. Exterior drainage to relieve the soil pressure may also be needed. In all an involved and undoubtedly expensive repair. A moveable object has met an irresistible force. In the buyer case, it may be time to move on. This is a very common problem here in Northern Ontario. Some of the fixes are far more cost effective than others. Often the problem can be solved simply by changing the grading outside the properly to cause the surface water to shed away from the foundation. As well, ensuring proper gutter, downspout and extensions are in place will help minimize the volume of water, and it’s corresponding pressure, from building around the structure. Until these fixes have been attempted then any other expensive corrective measures may be premature and unnecessary.